Shoulder arthroscopy is a minimally invasive procedure that allows doctors to properly diagnose and correct shoulder conditions. Through an endoscope entered through a half to one centimetre incision on the shoulder, the doctor can assess a patient’s shoulder joint via pictures and video. Arthroscopy was a procedure that was initially done only on a patient’s knee. 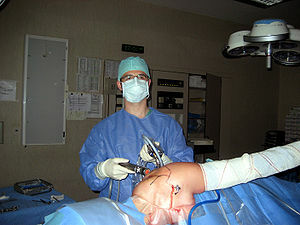 It is through the development of fiberoptic technology that surgeons were able to apply the procedure to the shoulder area. Aside from aiding in the diagnosis, a shoulder arthroscopy may also be done as an operative procedure. The patient may be put under regional or general anaesthesia while undertaking the operation. A different endoscopic instrument, camera, and fiberoptic light are then used for the procedure. The patient is usually operated on lying in a beach chair position or on his side. Although most doctors are aided by digital imagery provided by CT scans and MRIs, a shoulder arthroscopy is a better option in diagnosing shoulder joint problems because it is able to provide imagery for fine damaged structures that MRIs and CT scans usually overlook. Most shoulder joint problems manifest pain during movement. Because MRIs and CT scans require patients to stay in a resting position, the origin of pain is harder to pinpoint. A shoulder arthroscopy is therefore the better option for diagnosing dynamic problems. Unlike other procedures that patients undergo for proper diagnosis, a shoulder arthroscopy combines diagnosis and therapy in one sitting. In less than eight minutes, a patient’s condition can be appraised by a doctor and an operative procedure to correct the problem can already follow. This kind of operation usually takes anywhere between twenty minutes to an hour. This is beneficial for the patient as the burden of having separate procedures for diagnosis and treatment is lifted. The use of small incisions as opposed to traditional large ones also make the time for recovery shorter and at the same time minimizes the risks that come with surgery. Shoulder arthroscopy is usually performed in patients suffering from shoulder dislocations and instabilities as a result of trauma. Calcific tendinitis, rotator cuff tears, and impingement syndrome are some of the other conditions that the procedure effectively diagnoses and treats. Although this procedure has been proven to be a very effective treatment, patients must remember that it must be performed by highly skilled surgeons that have received proper training and have had lots of experience.